Recently a group of American tennis players formed a tennis club to do more than just play tennis. The group is called Manta Tennis. Their goals include playing Japanese tennis teams, learning more about Japanese culture and sharing their own American culture. 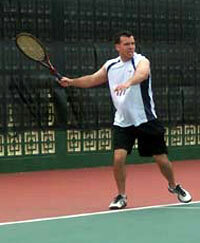 Many of their players had competed against Japanese players in tournaments on the island. “I was most impressed with their consistency on the court. I felt like I was hitting against a wall. What I hit over the net always came back and that was tough to handle”, said Wally Dawson, the team’s manager. “Beyond the tournaments though, we did not have any other interaction with these players. So, a group of us came up with the idea of creating this team and to begin seeking out these players and their teams for some friendly tennis” he noted. The group officially formed in January 2008 and now has 20 members with more joining each month. The newly formed group was ready to play other Japanese teams but communication was a roadblock. A few Manta Tennis players spoke some Japanese and the group knew that native Japanese speakers were needed for effective communication. So friends and co-workers of the players were ‘volunteered’ to help translate emails, face-to-face conversations, publications, etc. “I think word is slowly spreading about our intentions to play tennis and participate in cultural exchange with the Japanese,” said Manta member Daniel Ramirez. Contact was established with some of the Japanese teams through their websites. Manta Tennis contacted the American Chamber of Commerce of Okinawa (ACCO) seeking contact information on Japanese groups that may be interested in athletic and cultural exchanges. Gordon Bolton, chair of the English in Education Committee with ACCO, has begun assisting the group by establishing contact with some of the local universities. “Tennis is the common ground from which we can build friendships with the other players. At a minimum they can practice English on us and we can practice Japanese on them. A language class cannot compete with face-to-face conversation,” commented Wally. “We have played a team from Ginowan twice and they were a lot of fun. Now, other teams in Naha are contacting us about playing with them so we are very excited about these developments,” said Mark Nieswiadomy another member of the group. 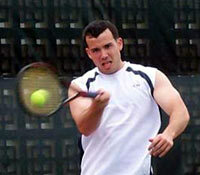 Manta Tennis plays a competitive level of tennis but stresses friendship above all else. “The Japanese players are so cordial on the court. They will complement a good shot that you may hit. They are also very focused on each point which makes them that much more competitive,” noted Wally. The group hopes that teams will be interested in social activities off the court such as dining at their favorite restaurant or visiting local historical sites like the castle ruins.